In a testament to cross-checking in research, I have uncovered a media account involving Davenport and his inspirational mentor, cartoonist Thomas Nast (1840-1902). Homer’s mother, according to Davenport family lore, asked her husband on her deathbed to encourage Homer’s art so that he might become another Nast. This occurred, and then some. By 1901 both men were successful and living in New Jersey. Nast, on the downside of an incredible career; and Davenport almost midpoint into his. But did they ever meet each other? The closest reference that I found was a short piece in the New York Times in 1903, about six months after Nast died of Yellow Fever in Ecuador. It recounted a lecture Davenport held in Nast’s hometown of Morristown, which at the end he pledged to help raise funds for a commemorative statue of Mr. Nast. The Nast archives are likewise silent of any mention of Davenport. However, Nast was not known as a letter writer, according to his biographer Albert Bigelow Paine. Now, I have uncovered a media account of Davenport and Nast, leading to an interesting tale of a Hospital Bed Endowment Fund, “Florodora” Girls, Baseball and ultimately fraud. It all started with Ebay. Rowland Claude Bowman (1870-1903) was a political cartoonist from the Minneapolis Tribune, and who had published a couple of books prior to his untimely death at 33: Several volumes of his work for the Tribune, and one book of children’s verse entitled “Freckles and Tan.” The first edition, published in 1900, featured illustrations by Bowman himself. However, a second edition, published a year after his death, was illustrated by one F.Y Cory. Fanny Young Cory (1877–1972) was unique for her time, a highly talented and successful artist in her own right. She went on to illustrate numerous books, (including early editions of L. Frank Baum’s Wizard of Oz series) and several comic strips over the years. She lived a long and productive life, working from her and her husband’s Montana ranch. Her book of paintings and verse, A Fairy’s Alphabet is still in print. Turns out, she had a similarly talented brother, John, who was a New York political cartoonist who lived in New Jersey. John Campbell Cory (1867-1925) doubled as a strip and political cartoonist. 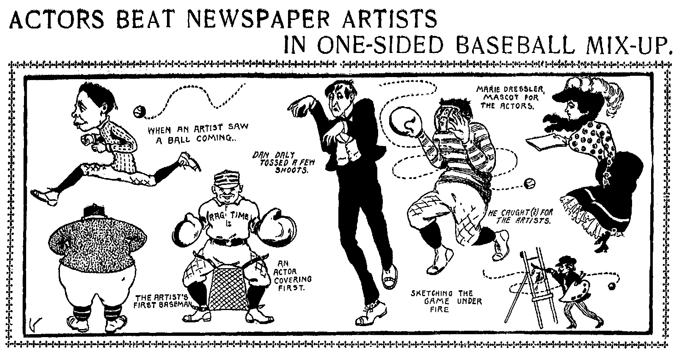 He eventually wrote The Cartoonist’s Art in 1912, as kind of a “how to” manual for aspiring young cartoonists. He also worked for Hearst’s New York Journal during the same time Davenport did. A cross check with “Cory” and “Davenport” yielded a delightful link to “The Strippers Guide” a blog by historian Allan Holtz dedicated to comic strip artists. A feature on Sydney B. Griffin, a strip cartoonist from this same era, recounted the details of a short article from the New York Sunday Telegram. The September 22, 1901, story reported the upcoming charity baseball game between actors and artists to be held at the New York at the Polo Grounds on October 7. The goal of the game was to raise money to endow a hospital bed for newspaper artists. The list of players was a veritable “who’s who” of the New York political art scene: Besides Syd Griffin, the group included Richard Outcault, Louis Dalrymple, James Swinnerton, and J. Campbell Cory. Outcault was manager, Davenport is listed as pitcher, with Jimmy Swinnerton as shortstop. A final paragraph notes that “…Miss Lillian Russell from the first accepted the position of official scorer, and the veteran [cartoonist] Thomas Nast will be her associate in that delicate but important office…” This would have been just over a year prior to Nast leaving for Ecuador, having been appointed Consul General by President Theodore Roosevelt. Lillian Russell (1860-1922) was an famous actress the era, and friend of the Davenports, having attended several of the exotic Barbeques hosted there. So I started scouring the papers for late September and October in hopes of finding more details about the game. Keyword “Nast” brought up a short piece from the New York Times, dated September 26, in which Mr. Nast the sent a congratulatory cartoon to the Times, in honor of that paper’s fiftieth anniversary, (right). The next hit came from the New York World, run by Hearst’s arch rival Joseph Pulitzer. This article, dated October 7, the day of the game recounted the practice game held the day before. Obviously written by a member of the World’s dramatic staff, it only mentions the names of the actors playing, which included members of the cast and chorus line of the hit Broadway musical production of “Florodora.” Indeed, the “Florodora Girls” as they were known were to be the major draw. The next day, The World ran a rather lengthy account of the game itself. It included an illustration, no doubt by one of the World’s staff cartoonists, (below). There appears to be a “G” in the lower left corner of the cartoon, possibly representing Syd Griffin. Again, no artists were mentioned by name, although many of the actors were. The illustration however did include an apparent caricature of Jimmy Swinnerton running, (Upper-left, “When an Artist saw a ball coming.”). 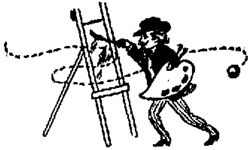 In the lower right corner, an “artist” is painting the scene with easel and paint tray. The artist, while looking rather stereotypical of a bohemian type: Goatee beard and western-style hat, had the main attributes of Mr. Nast. Indeed the self portrait from September 26 Times piece was very similar to the “artist” in the cartoon. The umpires were listed as Eugene O’Rourke, P. Wilder, Christy Mathewson and “Rube.” Of these folks, Eugene O’Rourke (1863–1917) and Marshall P. Wilder (1859–1915) were both actors, although Wilder was also an artist. Christopher “Christy” Mathewson (1880–1925) however was a Major League pitcher with the New York Giants at the time. “Rube” might have pitcher Charles Edward “Rube” Waddell (1876–1914) who was at the time of this game ostensibly playing for the Chicago Orphans, but notoriously bouncing around quite. O’Rourke had started out playing third base, but “retired” to the umpire position. At which point, vaudevillian comic actress Marie Dressler (1868-1934) stepped up to the plate and volunteered. The article reports: “After a consultation between Louis Harrison, Dan McAvoy, Eddie Foy and Burr McIntosh, it was decided that the gentlewoman could do more effective work as a mascot.” Dressler went on to an extensive career in films, eventually winning the Best Actress Oscar in 1931. Then a final clue. From the Monday, October 12 edition of the New York Dramatic Mirror, also from “The Strippers Guide” site. The Mirror reported that the frosty weather kept the attendance low and official scorer Lillian Russell and the chorus girls away. After five innings the game was called. As it turned out, Davenport did not pitch because he had left for Oregon to see his ailing father. So Nast may well have been on scene, but Davenport, Lillian Russell and the Florodora Girls were not. The contact for the game and charity was listed as “A. Stone,” with an address in the N.Y. World Building. 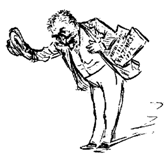 This would have been Abram Stone, one of the principals involved in the New York School of Caricature, of which Mr. Cory, Syd Griffin and Lou Dalrymple were also involved. No further word as to the outcome of that investigation however. In the long run, one of those research dead-ends. But an interesting story nonetheless! The search for the Nast / Davenport connection will continue elsewhere it would appear.